Mercy Sunday's Special Graces, Plenary Indulgence: Are They the Same? A Mr. Dwyer asked: What is the difference between that special graces promised by Jesus for devout communicants on Mercy Sunday, and the plenary indulgence for Mercy Sunday devotions that was instituted several years ago by Pope John Paul II? Are they the same thing? Or are they different? Simply put: They are NOT the same thing! The main difference, of course, is that an "indulgence" is something offered to the faithful by the Church, as the keeper of the keys of the kingdom, with authority to "bind and loose" (see Mt 16:17-19). The special graces of Mercy Sunday, on the other hand, were promised directly by our Lord, through a prophetic revelation given to St. Faustina (see Diary of St. Faustina, 699). The Church has not officially ruled that this particular promise was an authentic supernatural revelation (and no Catholic is required to believe it as a matter of faith), but the Church has discerned, in various ways, that there is nothing that violates Catholic doctrine in this promise. 1) The special graces that our Lord promised for Mercy Sunday come solely through the reception of Holy Communion on that day, in a state of grace, with trust in The Divine Mercy. Any plenary indulgence granted by the Church, on the other hand, involves the fulfilment of a number of conditions, including prayer for the pope's intentions, confession and Holy Eucharist, and the carrying out of the special indulgenced work (in this case: participating in public devotions to The Divine Mercy on Mercy Sunday itself). 2) The special graces promised by our Lord for Mercy Sunday can be received by a soul in a state of grace, but with imperfect love for God, and imperfect contrition for sin—as long as the soul merely trusts in the Mercy of God, and clings to Him because of His promised benefits. A plenary indulgence, however, can only be obtained through the performance of an indulgenced work as an expression of pure love for God. If the intentions of one's indulgenced work are not pure (say, the work is done in part out of fear of hell or purgatory, and loathing for oneself — or the desire to impress one's friends and relatives! — rather than purely out of love for God) then the indulgence obtained will be only partial, not plenary. 3) The special graces that our Lord promised for Mercy Sunday can only be received for oneself, through the devout reception of Holy Communion on Mercy Sunday (as stated in #1 above). A plenary indulgence, however, can be offered for oneself, or for souls suffering in purgatory. 4) The most special grace promised by our Lord for Mercy Sunday is nothing less than the equivalent of a complete renewal of baptismal grace in the soul: "complete forgiveness (remission) of sins and punishment." Such a measure of grace can only be received otherwise through baptism itself, or through making a sacramental confession as an act of perfect contrition for sin, out of pure love for God. As you can see, this is no easy topic. However, you can find a more in-depth treatment of this same subject in the John Paul II Institute of Divine Mercy section of this same website, in the document entitled "Understanding Divine Mercy Sunday." The Fifteen Prayers as revealed by Our Lord To Saint Bridget. I have been saying these for over a year. There are 21 promises from Our Lord for those who say these every day for a full year. #18 Every tome one recites these prayers,he will gain 100 days indulgences. All should do this for their families and them self. With regard to our Lord's promise to "grant a complete pardon...", continues with the stipulation,"...to the souls that will go to Confession and receive Holy Communion on the Feast of My mercy. " (paragraph 1109). Your explanation seemed to be more liberal regarding the timing associated with reception of Confession. Thank you for such a helpful article. Unfortunately, it is not still possible. That would be to treat the extraordinary grace promised to us by Jesus through St. Faustina for the reception of Holy Communion on Divine Mercy Sunday itself into another plenary-indulgence type offer. The requirement of Sacramental Confession for receiving that complete renewal of baptismal grace (the extraordinary grace: the complete remission of sins and punishment) was meant by our Lord to prepare the soul the best way possible for the reception of Holy Communion on the Feast Day itself, and to insure that we receive the Blessed Sacrament that day at least in a state of grace. Making one's Confession afterward--while it is always good to go to Confession!--would not be helpful toward that particular purpose. It is the Tuesday after Divine Mercy Sunday. While it is too late to fulfill the requirements for the plenary indulgence for Divine Mercy Sunday, can one still receive the promises associated with the feast if one has devotely received Holy Communion and plans to receive the Sacrament of Reconciliation within eight days of the feast? We would like to spread the word about this by e-mail if it is still in effect. Being free from attachment to sin means there's no sin you're unwilling to give up. At the time you do the work with the indulgence attached, you need to be willing to give up every sin. That's attainable even by those who have not reached habitual heroic sanctity. You therefore need to be a saint to gain it. Thank You sincerely for your explanation. I now have a better understanding of the requirements of special graces of Divine Mercy Sunday, and the indulgences available through the Church. If God is willing I will be able to participate next year in the beautiful devotion. Saint John Paul II, pray for me. I have met the conditions (will be going to Confession this Wednesday) but did not attend a public Divine Mercy service. Does this mean I do not "qualify" for the plenary indulgence? What Wendy wrote makes sense to me. It seems that while we are in this life it would be almost impossible to have anything but imperfect love of God. Further, we say in the Act of Contrition, "I detest all my sins, because of your just punishments, but most of all because they offend you, my God, who are all good and deserving of all my love." Since all the faithful are encouraged to say this prayer and required to say it or something similar at confession, it seems that having a mixed motive including dread of punishment would not get in the way of of any remission of sins or punishment, even in a plenary indulgence, as long as love of God is present and foremost. I am interested in Dr. Stackpole's thoughts on this. Greetings! I tried to email this to you, but twice the delivery has failed to [email protected], so I'm taking this route instead. I found your site while doing research on an item which appeared in our parish bulletin, which I realize now was a re-print of part of your article. (This one: http://thedivinemercy.org/news/story.php?NID=2485) I'm quite concerned about one thing you said, because I think it's incorrect regarding the conditions for a plenary indulgence. You said " A plenary indulgence, however, can only be obtained through the performance of an indulgenced work as an expression of pure love for God. If the intentions of one's indulgenced work are not pure (say, the work is done in part out of fear of hell or purgatory, and loathing for oneself — or the desire to impress one's friends and relatives! — rather than purely out of love for God) then the indulgence obtained will be only partial, not plenary." Can I strongly urge you to change your position, and let that be known? This indulgence is such a gift, to the imperfectly motivated as well as to the perfectly motivated; and it will be such a sadness if people don't make the most of this gift of Mercy because they misunderstand the requirements. 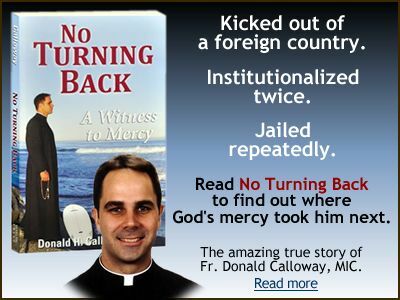 Thank you for your work to spread the message of Divine Mercy. What about people who cannot receive Holy Communion or attend Mass (prisoners, dying, illnesses, etc.) but earnestly desire to participate and receive the graces available on Mercy Sunday. There is no set "time frame" for making your confession in preparation for Divine Mercy Sunday communion because the goal is simply to be able to receive Holy Communion in a state of grace on that day. so as long as you are sure you have not committed a mortal sin since your last confession, that last confession still is, in effect, your preparation for Mercy Sunday, even if it happened weeks or even months before the Feast. Of course, that is doing the bare minimum. It is still a good thing to make your confession as close to Mercy Sunday, in advance, as possible, because it is good for the soul to clear away even venial sins in preparation for receiving Communion on that wonderful day. As for "what sins are forgiven" thru confession, and communion on Mercy Sunday: ALL sins and punishment, without any exception whatsoever!! !A complete renewal of baptismal grace--similar to what happens in an adult baptism. In order to receive the full plenary indulgence, when does one need to receive the sacrament of reconciliation by? Most people receive it at least once during lent, does that count? Is an additiional one required during the Divine Mercy Novena? I was told by someone today that confession needs to be heard again between Divine Mercy Sunday and next Sunday even though my last confession was heard during the weekend of Palm Sunday. Can someone please clarify, thank you. sorry if this is a little off subject, but a few years back i was visiting cracow cathedral and was told by a tourguide that if you visited and prayed at 12 altars in cracow, 4 of which were in the cathedral, that you could gain plenary indulgences. now that i am going back, i was trying to find information on this and could not. was this just for a particular jubilee or maybe for the occasion of Bl. John Paul's beatification? I certainly learned much from this. I thought I knew what was necessary to receive the graces today, but I was obviously confused and didn't even know I was confused. May God reward you for setting me straight. I will share this clarification with my friends. I have a question. I say the Divine Mercy Chaplet every day for the souls in Purgatory and I have studied the Enchiridion of Indulgences. I try to obtain an Plenary Indulgence every day that I receive Communion for the souls in Purgatory. It is my understanding that you can't obtain a Plenary Indulgence for the living, but the Divine Mercy information often refers to the "sick and dying". My brother is dying of cancer and may have a month to live. I have offered the Novena this week and intend to offer all tomorrow for him. Can I obtain for him a Plenary Indulgence tomorrow or not until he dies? You have clarified this most important issue for me and possibly others. There is this difference: a plenary indulgence can only be attained if one carries out the conditions for it "without any attachment to sin whatsoever, even a venial sin" as the Church has often said. 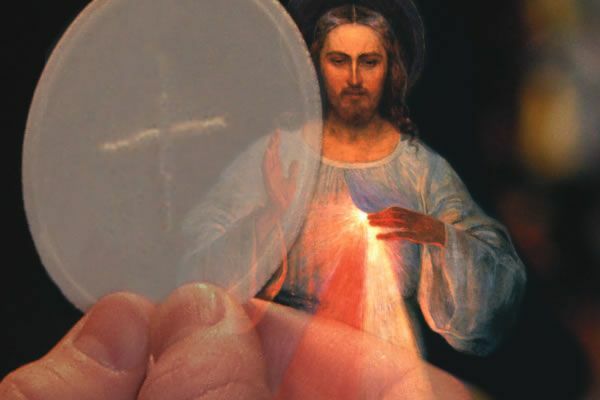 The extraordinary grace of Holy Communion on Divine Mercy Sunday, however, can be attained solely by receiving Holy Communion in a state of grace, with trust in Divine Mercy, on Divine Mercy Sunday. One might say that a plenary indulgence requires acts of perfect contrition or pure love of God in a way that the extraordinary grace does not. Ordinarily, only Baptism bestows grace in this way on the soul, and that is why the extraordinary grace of DM Sunday has been called by theologians a "complete renewal of baptismal grace." So the degree of grace obtained in the end would be equivalent, but the manner of attaining it is quite different. Is there any difference in the equivalent of a complete renewal of baptismal grace in the soul: "complete forgiveness (remission) of sins and punishment" and any other plenary indulgence? We have learned that Mercy Sunday is like a "new Baptism." Isn't the forgiveness of sin and remission of temporal punishment due there of equivalent? Very interesting. I was wondering about this subject too. Thanks.